Packed in our STK Box. If order more than 4000sets,can be packed with your own design especially for you. 2. 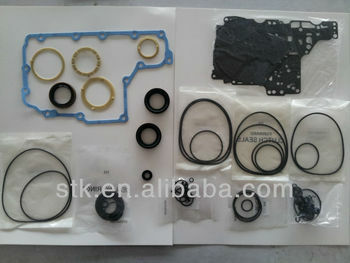 STK Master Kit including Overhaul Kit & Friction Kit & Steel Kit. All Kit without Pistons & Bands & Filter. 3. We can manufacture your own bags (not including design) for you by free if your order over 5000 sets of OHK. 1.O-Rings: Good elastic, good sealability, high temperature resistance ( pass the 180 degree high heat test) and anti-deforming, can use about 3 years. 3.Metal clad seals : No deformation, not leaking ,can be NOK brand as requested. 4. Sealing rings: hard and good sealabilty. 5. Thrust Washers: good quality. Steel kit/Steel disc, Friction kit/Friction disc/ Clutch, Gaskets, Pan Gasket, Metal Clad Seals/Sealing Rings/Thrust Washers/Filters /Piston/Drum/Brake Bands and other accessories for all kinds of car, which used in TOYOTA,BUICK,HONDA, VOLKSWAGEN, AUDI, FORD, GMC, NISSAN, MAZDA, MERCEDES, BMW, LUXUS , CHERY, CHRYSLER,MITSUBISHI, DODGE, etc. We can send you our catalogs if needed.